Imagine a land of wide open spaces and magnificent wildlife, of idyllic palm-fringed islands set in turquoise seas, of explorers’ tales and sultans’ palaces, of a warm and hospitable people. This is Tanzania, where you can rediscover the wild, romantic Africa of your dreams, where you can relive all the enchantment of an ageless continent while still enjoying all the comforts and luxuries of modern life. Boasting over 95,000 square miles of reserves, Tanzania is one of the best game viewing countries in Africa. From Mount Kilimanjaro, the highest mountain in Africa, to Lake Victoria, the largest lake in Africa, visitors will find a country with vast and breathtaking vistas. The complete African safari experience is truly represented in game reserves and national parks such as the Serengeti, the annual setting of the wondrous wildebeest migration; Ngorongoro Crater, the unique, biodiverse amphitheatre; Selous Game Reserve, the vast and least well known park, and the amazing array of birdlife at Lake Manyara. East Africa has also been called the cradle of mankind. Early hominid footprints which date back an estimated 3.5 million years were discovered at Laetoli in Tanzania. And not to be forgotten are the “Spice Islands” off Tanzania’s coast, collectively known as Zanzibar. Explore Tanzania, and find an adventure unsurpassed in Africa. Location: Tanzania is located in East Africa bordering the Indian Ocean, between Kenya and Mozambique. 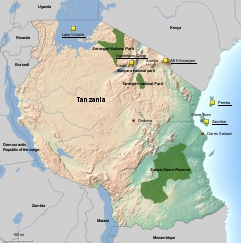 Size: Tanzania covers 365,755 square miles, a little more than twice the size of California. Capital City: Dodoma is the official capital, but the commercial capital and largest city is Dar es Salaam. Population: Close to 50 million people live in Tanzania. Languages: Kiswahili is the official language, along with English (primary language of commerce, administration, and higher education), and Arabic (widely spoken in Zanzibar). There are over a hundred local languages spoken throughout Tanzania, including Maa spoken by the Maasai. The Flag: Tanzania’s flag was adopted when the country became independent from Britain in 1964, and formed by joining Tanganyika with the islands of Zanzibar. The green alludes to land, while black represents the people who are native to Tanzania. Blue epitomizes the Indian Ocean, as well as the numerous lakes and rivers. The thin gold stripes stand for Tanzania’s mineral wealth. Currency: The Tanzania Shilling (TZS) is the local currency, although US Dollars are widely accepted at tourist lodges and safari camps. Getting to Tanzania: The main points of entry from the US are: Kilimanjaro International Airport (JRO) which is close to the town of Arusha, and Dar es Salaam (DAR) in southern Tanzania. Zanzibar (ZNZ) is a gateway for regional flights and some European charters. Precision Air offers a decent network of domestic routes within Tanzania, as do several charter companies who operate flights between the major national parks. Combine Tanzania with: Kenya, Uganda and Rwanda. Movies/Documentaries: Africa: The Serengeti (IMAX); People of the Forest, The Chimps of Gombe (1988); Serengeti – The Adventure (2013). Arusha is the gateway to most safari destinations in Tanzania. Arusha is approximately 30 miles from Kilimanjaro International Airport and sits at an altitude of some 4100 feet above sea level. The town is at the base of Mount Meru and is a wonderfully fertile area producing coffee, wheat, sisal and maize. Just a short distance from the town of Arusha is the Arusha National Park, which was described by Sir Julian Huxley as “a gem amongst parks”. It consists of three spectacular features, the Momela Lakes, Meru Crater and the Ngurdoto Crater. On clear days magnificent views of Mount Kilimanjaro and Mount Meru can be seen from almost any part of the park. The vegetation and wildlife varies with the topography, which ranges from forest to swamp. The park is famous for its 400 species of birdlife, both migrant and resident, and the black and white colobus monkey. Other animals frequently seen are baboon, elephant, giraffe, buffalo, hippo, leopard, hyena and a wide range of antelope. Because of its proximity to Arusha, it is an ideal park for a day excursion. Tarangire National Park gets its name from the river that threads its way through the length of the reserve. The Reserve supports a great diversity of wildlife, including giraffe, buffalo, lesser kudu, eland, oryx, zebra and the predators. Unusually large herds of elephant inhabit this sanctuary, while majestic baobab trees dwarf the animals that feed beneath them. Wide panoramas of open acacia woodland and grassy savanna studded with large baobab trees mark Tarangire, a lesser-known scenic gem located in southern Masailand. In the dry season months from June-October, huge herds of elephant and other big game species move peacefully toward the blue gleam of Tarangire’s namesake river. Fringe-eared oryx and lesser kudu are among the unique resident species and lions are common. Tarangire is also heralded as an ornithologist’s paradise. For a fascinating cultural experience we encourage you to participate in the tribe visits and walks. As you approach Lake Manyara National Park, the Rift Valley escarpment looms on the eastern horizon forming an impressive backdrop to the lake. Nestling at the base of the Great Rift Valley escarpment the park is noted for its incredible beauty. The mosaic of the Park’s varying habitats is easily seen: the rift wall, the ground water forest, acacia woodlands, open grassland, the lake shore, swamp and the lake itself. Visitors are likely to see lion, oftentimes resting up in the acacia trees, zebra, elephants, waterbuck, hippo, baboon, and a large variety of bird life. It is difficult to imagine a more spectacular setting on the edge of the Mto Wa Mbu escarpment, overlooking the Great Rift Valley and the stunning Manyara soda lake. Tree climbing lions are but one lure. The extraordinary birdlife has made this place world-renowned among ornithologists, who come to observe the masses of pink flamingos and birds of prey. The Ngorongoro Crater, at 2,286 meters above sea level, is the largest unbroken caldera in the world. Millions of years ago, Ngorongoro may have rivaled Kilimanjaro in size, but as its volcanic activity subsided, it collapsed inward, forming a caldera. Surrounded by very steep walls rising 610 meters from the crater floor, this natural amphitheatre covers an area of about 100 square miles, and is home to some 25,000 larger mammals, almost half of them zebra and wildebeest. The Crater is an African paradise and haven for lion, elephant, hyena, gazelle, buffalo, eland, hartebeest, warthog and some of the last remaining rhino in Tanzania. More than 100 species of birds not found in the Serengeti have been spotted here. The Crater’s lake is home to thousands of flamingo, which carpet the area with the glow of their pink plumage. The Crater has been declared a World Heritage Site. Nearby, in the Ngorongoro Conservation Area, are the famous archaeological sites of Laetoli and Olduvai Gorge, allowing the visitor a glimpse into our own past. And the pastoral Masai can be seen tending their herds of cattle, sheep and goats in their colorful and traditional dress. Largest of Tanzania’s national parks, and arguably Africa’s premier game park, the Serengeti is the setting for the most awesome wildlife spectacle on earth. Each year, more than two million wildebeest and zebra begin their great circular migration across the open plains and acacia woodlands. Huge columns of advancing zebras and ungainly wildebeest stretch as far as the eye can see with the predators following alongside. In their wake follow the predators: lion, cheetah and hunting dogs with vultures circling overhead. Serengeti means “endless plains” in the Masai language and within its boundaries are more than three million large mammals. The extensive grasslands are interspersed with “Kopjes”, islands of rocky outcrops which are home to their own wildlife communities which include leopard and hyrax to name a few. Other common species found here are hippo, giraffe, eland, impala and other antelope, baboons, monkeys and a profusion of almost 500 birds. The Serengeti will leave the visitor with images of vastness and breathtaking beauty. Dar es Salaam boasts one of the finest natural harbors in the world, and while it has therefore become a bustling port and economic center, it remains a place of fascination, with many reminders of its colorful past. Dhows still ply its waters. Dug-outs, filled with fish, bob by the harborside. The city also displays the many influences of its history. Enjoy the hustle and bustle of the Kariakoo Market where fish, fruit, vegetables, traditional medicine, herbs and livestock are traded. The maze of stalls and shops in the bazaar that surrounds the market is also worth exploring. Flights into and out of Zanzibar and the southern parks of Tanzania may well be routed through Dar es Salaam. Located on the warm Indian Ocean, the Tanzania Coast offers white sand beaches, hundreds of miles of palm fringed sands, first-class resorts and an array of water sports and fishing activities. The coastal areas are hot and humid with an average daytime temperature of 90 degrees F. Sea breezes make the climate very pleasant from June to September. In addition to the main port of Dar es Salaam, Bagamoyo is a seaside town steeped in history, once the center of the notorious slave trade. Its name is derived from the word Bwagomoyo, which means “Here I throw down my heart”, reflecting the desperation and despair of the “broken-hearted” captives whose voyage into the unknown began here. The city was also the starting point for the first European explorers on their way to search for the source of the Nile. Livingstone, Stanley, Burton and Speke all passed through Dar. Just south of Bagamoyo at Kaole are the ruins of a once prosperous Arab town, which was forced into decline by the arrival of the Portuguese in the 15th century. Ras Kutani is a delightful resort to the south of Dar es Salaam and an ideal extension to a more traditional safari in Tanzania. Ruaha, the second largest of Tanzania’s varied National Parks, with its dramatic geography, is truly a vast unspoiled wilderness. Its remoteness is part of its great attraction and charm. Ruaha has a hauntingly beautiful and wild landscape of miombo forest, rolling woodlands, hills, rivers and plains, possessing a great variety of wildlife, including lion, leopard, cheetah, hunting dog, warthog, giraffe, zebra, huge herds of buffalo and large concentrations of elephant. The dramatic landscape of this southern Tanzania reserve includes some areas of flat grasslands, but is primarily made up of rolling woodlands with hills in myriad shades of blue. The shining Ruaha River winds though the eastern section, fringed by tall trees, including the majestic baobab, almost a signature of Ruaha. Best months for game viewing are during the dry season from May to December, when the animals are concentrated around the shrinking water sources. Elephants and greater kudu are easily observed but the sable antelope takes some searching for in the dry woodlands. Although African hunting dogs are becoming rare throughout Africa, several packs of these distinctive animals can be seen in Ruaha. The diversity of birdlife in Ruaha is extraordinary, visited by both northern and southern migrants. Ruaha, a paradise of the outstanding natural world, is a marvel and delight to the adventurous safari enthusiast, a personal experience to remember. Selous, located in southern Tanzania, is the largest protected (21,000 square miles) and least exploited game sanctuary in Africa. A UN World Heritage Site, this pristine, uninhabited area is larger than Switzerland. The topography of the park varies from rolling savannah woodland, grassland plains to rocky outcrops cut by the Rufiji River and its tributaries. Selous boasts Tanzania’s largest population of elephant as well as large numbers of buffalo, hippo and wild dog. Other species commonly seen are lion, bushbuck, impala, giraffe, baboon, zebra and antelope from the majestic eland to the little klipspringers. The bird life is varied and abundant, with at least 350 species to be seen. The Rufiji and its tributaries, which flow from north to south, provide the lifeblood of the Selous. The network of lakes the river forms is ideal for water-based safaris such as boating or rafting, especially during the dry season between June and October. Crocodile, hippo and an array of grazing antelope can be seen. Wildlife observation and bird watching take place in a superb natural setting. Respecting nature’s rhythm, you can be assured of close contact with the wildlife. The Selous, famous for its elephants, was originally designated as a hunting area where animals are abundant, but more elusive than in the northern parks. Safaris on foot will provide a particularly intimate encounter with the African wilds, while excursions by Land Rover will offer great photographic opportunities and the chance to explore different sections of this vast park. Two hundred miles down the eastern shores of Lake Tanganyika, near Gombe Stream, where Dr. Jane Goodall continues her research of chimpanzees, is a place so remote that only the most intrepid travelers will ever reach it – Mahale Mountains National Park. Accessible by light aircraft and Tanganyika dhow (no roads or vehicles in the park), it is an exceptionally unspoiled wildlife sanctuary. With mountains rising to a height of 8000 feet, and lush semi-tropical forest, this region is home to roughly 1000 wild chimpanzees. Within a two-hour walk from your camp, you are in the awesome presence of these primates, who are totally at ease with your company. Watch them from mere yards away as they groom, wrestle and forage their way across the forest floor. If you tire of the trees, retreat to the lakeshore for sun worshipping, swimming, fishing and snorkeling. The gin-clear waters of the lake are inhabited by over 200 species of tropical fish, found only in Lake Tanganyika. Chimpanzee tracking and forest walks can be interspersed with dugout canoeing and stargazing. Situated in the Indian Ocean only 25 miles off the west coast of Africa is the “The Spice Island”, so named due to its export of cloves and a wide variety of the most commonly known spices. Zanzibar and its islands are bathed in the heady scents and romanticism of a bygone era. Gentle, soft-spoken islanders host you with warmth and grace. Zanzibar has a very colorful and exciting history. In the port of Zanzibar dozens of dhows carry on the tradition of spice and precious wood trade in the Indian Ocean. And exotic and romantic images come to life on this island of palm-fringed beaches and turquoise lagoons. Zanzibar has been luring travelers to its shores for many centuries. It was the ancient trading port of the sultans of Oman in the 19th century. It was from this island that the great European explorers Burton, Speke, Livingstone and Grant set off on their voyages of discovery in the uncharted mainland. Today the island is steadily developing and offers a unique combination of history, culture, friendly people and beautiful unspoiled beaches. Zanzibar Island boasts miles of golden beaches. Inland, the island is a garden of Eden offering the most exquisite tropical species. Many visitors to Zanzibar choose to combine a couple of days in town with a few days at one of the beaches. Mnemba, an untouched atoll off the coast of Zanzibar, is therapy for the spirit. This is where Bill Gates comes to unwind and savour Mother Nature’s delights, on this heart-shaped splash of sand in the blue depths of the Indian Ocean. These “Spice Islands” were discovered by Arab traders in the 8th century and have supplied the world with aromatic spices like cloves, nutmeg, and cinnamon ever since. The exotic combination of heady perfumes, gently swaying coconut palms and lush vegetation make this an irresistible destination for lovers. As tribute to its allure, Condé Nast Traveler chose Mnemba Island as one of the three most romantic ocean destinations in the world. Mnemba, an Arabic word meaning octopus head, lies two kilometres north-east of the island of Zanzibar, a 20-minute cruise in a traditional 16 foot flat-bottomed boat. A pristine swathe of beach defines the island’s one mile circumference. A protection zone surrounds the island, conserving magnificent coral reefs where giant turtles, ghost crabs and spectacular tropical fish drift through the lagoons. Fresh, delicate sea breezes waft through Mnemba Lodge, lending a castaway air to the entire island. North of Zanzibar, Pemba has been famous for centuries for its clove production. Today, the Pemba Channel (2400 feet deep) which separates the island from the continent, has become renowned as Africa’s premier place for deep sea fishing. Pemba also has pristine reefs and varied fauna including the great white shark and giant turtles. Take an excursion to the primeval forest of Ngezi and walk through the luxuriant vegetation, with its giant trees, ferns and endemic species. We also suggest a mini bus or motorbike ride along the East coast to visit the archeological sites and to the baobab forest of Micheweni. Do not miss a dhow or pirogue outing to the creeks or small islands and enjoy the veritable feast of lobsters, fish, fruit and spices. Mount Kilimanjaro is the tallest free standing mountain in the world, so can truly be regarded as the roof of Africa. “As wide as all the world, great, high and unbelievably white,” was Ernest Hemingway’s description of this majestic site. Its outstanding features are its three major volcanic centers, Shira in the west, Mawenzi in the east and the snowcapped Kibo in the middle. To climb Mount Kilimanjaro, at 19,340 feet, is a highlight for many fit adventurers. Hikers pass through zones of forest, alpine and semi-desert before reaching its snowcapped peak. There are several routes to the top, ranging from 5 -10 days, all led by experienced guides and porters. The best time of the year to climb Mount Kilimanjaro is mid-December to mid-March. During this time, the sky is clear, the days are mostly sunny and the view of the mountain is good. Alternatively, the period from mid-July to the end of September is also suggested. During these months, most of the days are cloudy but pleasant with no rains. Otherwise the mountain is open throughout the year. Located within the Ngorongoro Conservation area is the Olduvai Gorge. It was here that Dr. Louis Leakey discovered the remains of Homo habilis or “Handyman” regarded as mankind’s first step on the ladder of evolution. But many more fossils have been discovered here including those of prehistoric elephants, giant horned sheep and enormous ostriches.